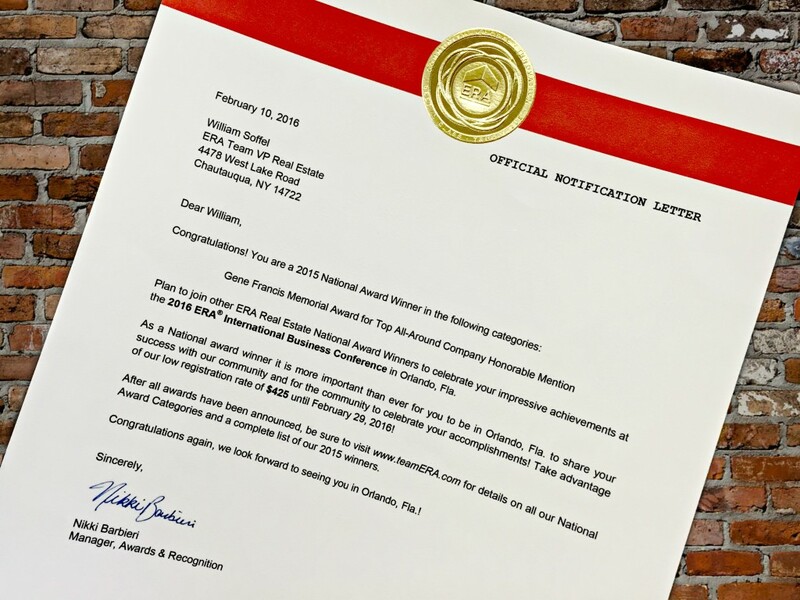 ERA Real Estate, a leading global real estate franchisor, has named ERA Team VP Real Estate of Western New York & Northwestern Pennsylvania led by Bill Soffel, Broker/Owner an honorable mention for the brand’s national top company of the year for 2015. The award, named after ERA Real Estate co-founder Gene Francis, is the highest honor given to an ERA® company, and reflects the qualities most respected throughout the global ERA system and the real estate industry. Known for his forward-thinking business acumen as well as his philanthropic spirit, Francis established a defining culture of service to which all ERA companies aspire. ERA companies earn a nomination for the award by maintaining high personal and ethical standards, demonstrating a strong business sense and modeling a commitment to ERA Real Estate and its community all while driving measurable growth in transactions, sales volume, per person productivity and sales rate. “Our affiliation with ERA Real Estate has proved critical to distinguishing our firm in the marketplace and all of us at ERA Team VP are deeply honored to earn this nomination,” said Bill Soffel, who oversees 11 offices and 90+ sales associates serving Western New York & Northwestern Pennsylvania. ERA Team VP Real Estate has 11 office locations throughout the Southern Tier of Western New York and northwestern Pennsylvania. For more information about ERA Team VP Real Estate and the local real estate market visit www.erateamvp.com or call one of the main office locations: (716) 789-2600 Chautauqua County Offices; (716) 699-4800 Ellicottville; (814) 726-3456 Warren.